The 6 little pieces of paper are scrunched up and sitting in the emptied out hopper, Craig Charity's hand hovering over them. A nervous air of anticipation and excitement fills the SCASA Coffee Theatre and the packed audience leans in their chairs towards the stage. The entire auditorium of the Sandton ICC is empty, the IFEA exhibition long closed for the day, except the 100 or people gathered around the Coffee Theatre. On those 6 little pieces of paper, 6 names. 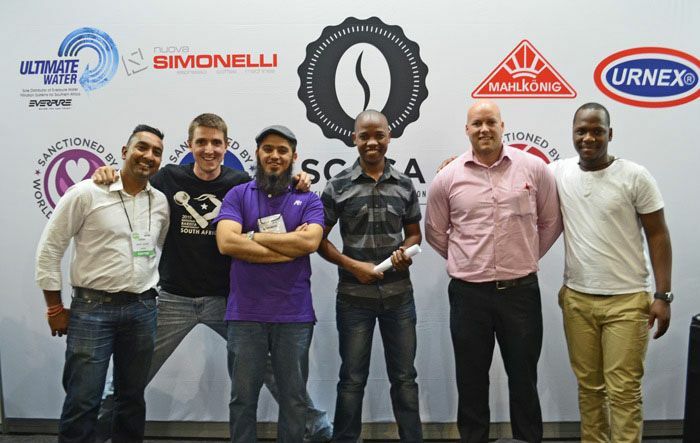 The top baristas in South Africa for 2014. One of them soon to be the new SA National Champion, with a ticket to Seattle to the Worlds Champs in April. "Travis Scott - Tribeca, KZN " calls the announcer as Craig opens the first piece of paper. The crowd erupts and quickly settles again to listen to the next name. "Ishan Natalie - Tribeca Gauteng" cheers, and whoops, an avalanche of applause. "Roderick Nzirainengwe - Union Hand Roasted - Western Cape", a pause and then like hail from a highveld thunderstorm on a tin roof, the applause is deafening. Roddie leaps out of his chair and nearly knocks over several people around him, hugging the person on his left and punching the air at the same time. 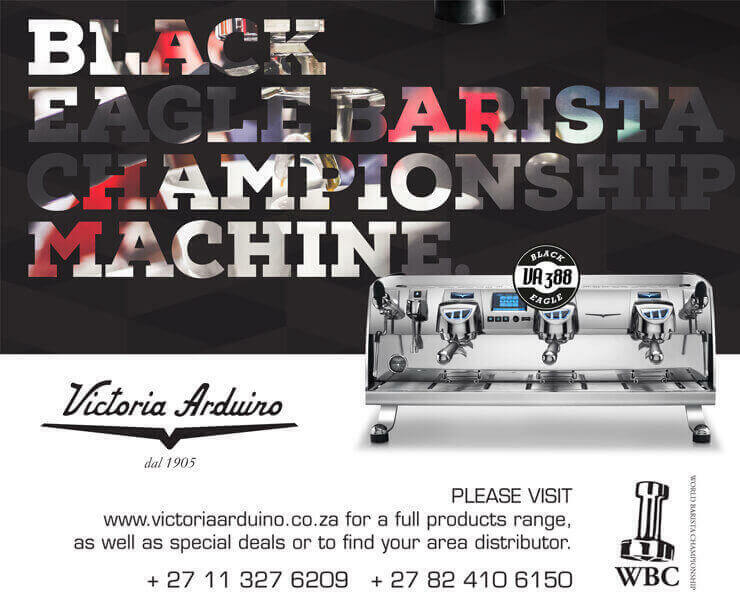 "Matthew Carter - Tribeca, Gauteng" which send team Tribeca into overdrive and people surge towards the lanky, much loved barista, his hands on his head in a state of disbelief. "Azhar Khan, Continental Bakery and Deli, KZN" . "Musa Magwaza - Lineage Coffee, KZN" and there is a mixture of crazy cheering, boisterous hugging and many gasps as the notion settles in that it's a very different top 6 to what people would have expected on paper. But barista competitions aren't fought out on paper. The barista competition format is brutal and the margins small. 15 minutes for their coffee to sing. Well done to all the baristas!!! Well hello Top 6!!! Ishan Natalie, Matt Carter, Azhar Khan, Roddie Nzirainengwe, Travis Scott, Musa Magubane. 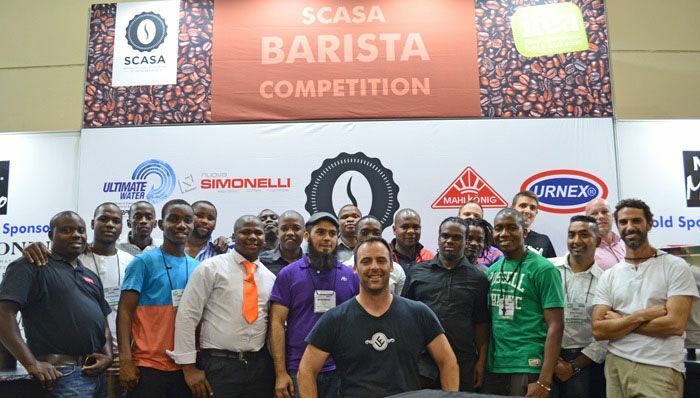 Most of the amazing baristas who competed! Congratulations to everyone, it is a hard task indeed to just make it to this point. The Famous Brands baristas were unfortunately not available for the announcement.